There really are two kinds of Americans. One type is of the Ayn Randian persuasion, believing that rapacious capitalism without safety nets is an ideal model for our country. The other kind believes that our Nation’s children represent the future and each and every one of them – regardless of class, race or social circumstances – deserves a chance at a productive life. The second kind of American is frequently derided as a soft-hearted liberal sop; but that’s a shallow analysis. We fail as a country when we fail our children – both morally and in terms of global competitiveness. This is why the revelations in Neil Barofsky’s new book — Bailout: An Inside Account of How Washington Abandoned Main Street While Rescuing Wall Street – are so disturbing. Barofsky was the Special Inspector General of the Troubled Asset Relief Program (TARP), put in charge to monitor how the hundreds of billions of taxpayer dollars were spent. According to Barofsky, the Home Affordable Modification Program (HAMP) did not have a goal of keeping struggling families and children in their homes. 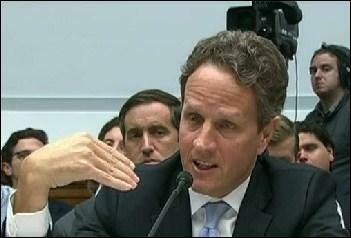 It’s real goal, according to U.S. Treasury Secretary Tim Geithner, was to “foam the runway” for the banks. The evidence that this is exactly what the plan was is buttressed by the thousands of homeowners who have reported that modifications were promised, they had completed the paperwork, months or even years went by, then with no warning they were foreclosed on by their bank. They were the foam; this is the new American runway.